Mount Kirishima consists of several volcanoes covering an area about 20x30 km with more than 20 eruptive centers. Shinmoedake, which last erupted in 1959, is approximately in the center. Eruptions have been recorded since 742, with strong eruptions in 788, 1716 and 1717 (Wiki). 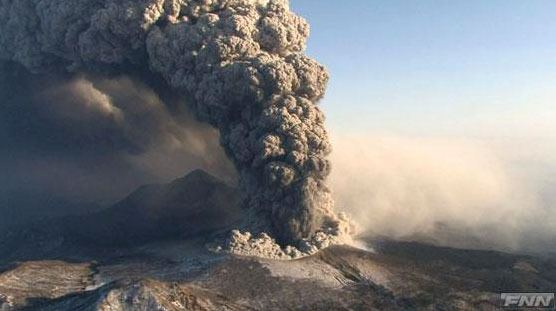 R. Imura published an "Eruptive history of the Kirishima volcano during the past 22,000 years" in Geographical Reports of Tokyo Metropolitan University, 1992. Geologic history older than 22,000 years is hidden by a very thick ignimbrite (ash) deposit from the eruption of the Aira caldera at that time. From 22-15 thousand years ago, five stratocones and two smaller volcanoes were formed. The main products of the eruptions were lava flows. Kirishima was fairly quiet between 15-7 thousand years ago, when eruptions then resumed. Eruptions from this volcano appear to have become more explosive with the passage of time. The eruption in 1959 was phreatic, that is, involving water. It resulted in the formation of a 500 m long fissure on the west slope of Shinmoedake. In 1991-1992 vigorous enough phreatic activity (steam explosions? not specified in the Imura article) caused authorities to ban climbing on it for about one and a half years. Other posts about volcanoes on this blog are: Klyuchevskaya, Merapi, Merapi and map of major volcanoes of Indonesia, Santorini, Matua (volcanoes and atom bombs! ), and Etna. A good blog on volcanoes is at the Smithsonian/USGS site. after read and article i am very much shocked Japan is now under the state of battle due to natural disaster. Wilson is referring to the fact that Shinmoedake erupted today (March 13). 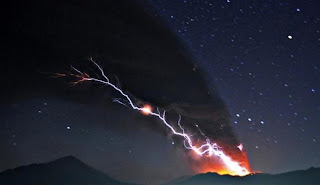 It is in southwestern Japan, started erupting in March, and was dormant for two weeks prior to todays eruption. Volcanologists feel that it is not clear whether or not the earthquake caused this eruption, and it may be impossible to ever tell with a volcano that is as active as this one. 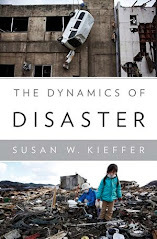 We know that there can be long distance effects from earthquakes ("teleconnections"), but proving them and finding a mechanism that causes these effects is difficult. There is a report on today's eruption of Shinmoedake at http://searchesntopics.com/2011/03/13/volcano-erupted-in-south-western-japan/.